According to retrospective studies, the early detection and treatment of neonatal hypothyroidism before 3 months of age greatly reduces the risk of mental retardation (Raiti and Newns 1971; Klein et al. 1972). 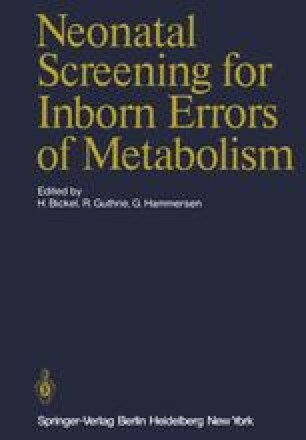 Owing to the difficulty in establishing an early clinical diagnosis, laboratory screening programs to detect neonatal hypothyroidism have been recommended (Fisher et al. 1976). In agreement with a previous study on cord blood (Klein et al. 1974), studies from our laboratory (Walfish 1975b, c; Walfish et al. 1976, 1979; Walfish, to be published) have confirmed that thyrotropin (TSH) is more sensitive than thyroxine (T4) for the detection of primary neonatal hypothyroidism by screening cord blood or dried blood taken on day 3–5 of age. However, in 1974, there was no antiserum available with sufficient sensitivity to permit the measurement of TSH from dried blood until later through the efforts of A.F. Parlow and his co-workers a suitable assay was established (Larsen et al. 1976). Accordingly, our regionalized program was commenced in 1974 to obtain epidemiologic data on the incidence of thyroid abnormalities in this geographic area using cord blood serum, which permitted a serum TSH supplementary test after an initial T4 screening by techniques previously described (Walfish 1976; Walfish, to be published; Walfish et al. 1976, 1979).